Read the blogs of the champions from 2015! Read the blogs of the champions from 2014! The story behind "Blind Applying"
Does this sound familiar? So many jobs, so many options, and maybe so many preconceptions? Which employer is best suited to me? Once you've found an interesting position, the next step for most companies is just "apply now". But that means writing an annoying introduction letter every time, not to mention a time-consuming letter of motivation – ideally personalized and adjusted to each employer. Yeah, this standard-issue application principle isn't always quick and easy for students. And on top of it all, it's no fun, thinks cooperative master's student Sabine Burmeister. Once you've sent off the application, the great guesswork begins: will I get an answer or not? "It's just silly and annoying," she complained to her boss Frank Staffler, Head of HR Marketing at Deutsche Telekom. To which he replied: "Make it better" with a laugh. The gauntlet had been thrown down. "Challenge accepted!" came the answer. My dear fellow students, what do we want? That was June 2013. All that was missing were the companies. And then, an opportunity arose: Stockholm. 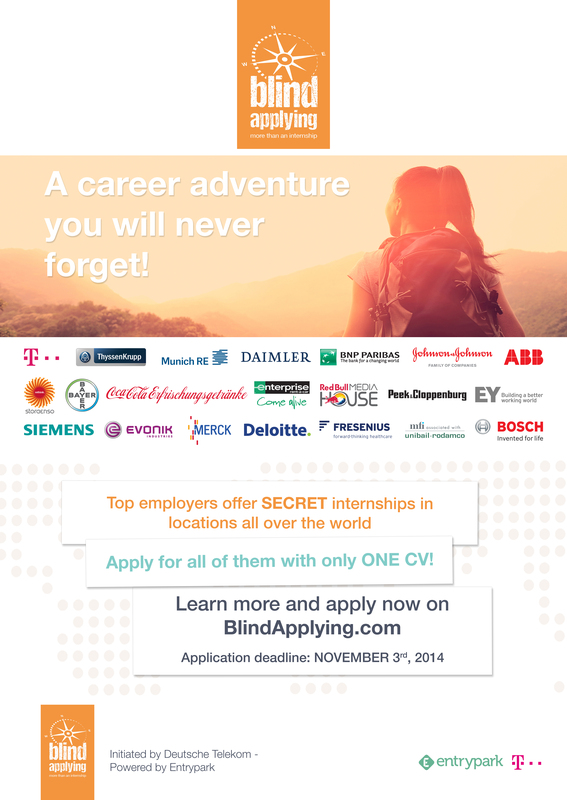 Blind Applying was intended as an umbrella project involving many companies with one single focus: the student. "At Potentialpark's Future Forum, HR teams from top companies meet for two days in Stockholm," explains Frank Staffler. "Everyone is pursuing the same goal there: creating new and innovative application tools. Under the motto 'Applying online and loving it'." A ten minute presentation. 30 seconds of quizzical silence. But the applause that followed sealed the deal – and the idea became reality. Interested companies got in touch. Sabine Burmeister was speechless. The career platform Entrypark joined first as campaign partner for implementation, marketing to universities around the world and applicant management. Innovator Telekom took on project management and communication – and voilá, here we are today. OK - in reality it wasn't all that fast. But within just a few weeks, a lot had happened for the 18 companies: internships and locations were found, new ideas collected and bureaucratic obstacles mastered together quickly and efficiently. The enthusiasm for mystery solving and something new brought everyone together. "The companies rattled through their to-do lists extremely quickly and brought plenty of enthusiasm and fun to the project. Everyone really put their heart into it. Thank you." says Sabine. And now it's your turn. If you like the pilot project, the idea of having a chance at 18 internships worldwide through just one application, the direct contact with 18 top employers who will find you a suitable job, then apply – "And this time it really is quick and easy", Sabine assures.